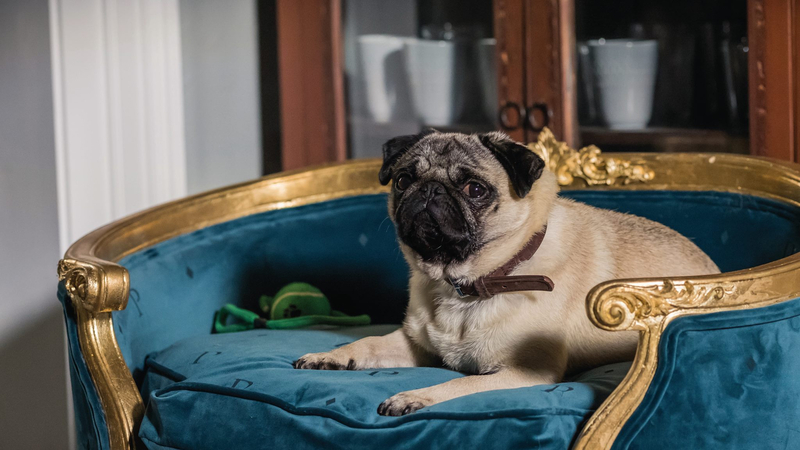 The phrase “man’s best friend” is put firmly to the test in Patrick, a new British comedy from Absolutely Fabulous: The Movie director Maddie Fletcher. Sarah (Beattie Edmondson) is the odd one out of her family. Her life is messy, love life a constant disappointment and feelings of living in her sister’s shadows accentuated by her parents’ disparaging comments. It takes a further turn, however, when Sarah is bequeathed a pug by a deceased family member days before she’s due to take up a new position at the local secondary school. The pug, named Patrick and formerly treated by royalty, rubs Sarah up the wrong way from the start as she struggles to keep him under control and hide him from her landlord (the flat she rents in leafy Richmond is conveniently a no pets zone). The script, credited to no more than three screenwriters (one of which being Vanessa Davies, who came up with the idea), is predictable and innocuous, yet peppered with comedic moments that are deserving of a chuckle or two, if only for the way they’re played by the talented cast. Edmondson is a bright spark; her obviously flair for physical comedy clear and well utilised. Her commitment to the role is due praise, and by the end it seems like Sarah has made a real turning curve in her life. The likes of Emily Atack, Jennifer Saunders and Gemma Jones each have their moments in supporting roles. That all said, pug is the star of the show here. The longer the squashed-face dog and Sarah spend with one another, the more the relationship between them develops. The film has little drama, even the love triangle amounts to nothing. The main narrative here, aside from the aforementioned bonding of woman and dog, involves Sarah’s inability to run, despite having signed up to a 5K in a bid to impress a fellow teacher (Adrian Scarborough) that, for no apparent reason, seems content to watch her fail. It’s fine though, as Amy Macdonald is on hand to sing a set of songs to ensure that the mood remains brisk even when things turn slightly awry. It’s likely to be written off completely by some audiences based on its marketing that has been, for want of a better word, cringeworthy. But while Patrick certainly isn’t life-changing by any stretch, it’s hardly worth being outright maligned. It’s wholesome family fun that’s cute and fitfully amusing, with a soundtrack almost entirely devoted to harmonious songs by Scottish singer-songwriter Amy Macdonald. For her debut as lead, Edmondson could have done a lot worse, and the production elements capture London in a cosy, natural worth that’s feigned but well suited to the light material.